Nico Rosberg and Lewis Hamilton in Latest Mercedes-Benz Ad "Success has Two Sides"
Mercedes-Benz is using an exceptional campaign to show the benefits of its Plug-In Hybrid technology. Both the C 350 e and the MERCEDES AMG PETRONAS Team’s current F1 car embody the headline 'Success has two sides. More electricity. Less fuel. 'Both the racing car and the series model are the product of ground-breaking, new technologies. The campaign shows how Mercedes-Benz brings innovative hybrid technology from the race track to the street so everyone can experience it. The international campaign consists of six print motifs and a TV commercial. In the print motifs, the C 350 e presents itself far away from the city on forgotten streets which run through a prohibited area. The streets are rough and dusty – the perfect testing ground for hybrid technology. Here, the benefits of the C 350 e come to the fore: efficient, dynamic and comfortable. Extreme perspectives bring the benefits to the fore in the motifs. The print campaign will run until September 30th, 2015. The C 350 e, the second Plug-In Hybrid model that Mercedes-Benz is introducing after the S-Class, convinces with its exceptional dynamism and efficiency. The vehicle allows up to 31 kilometres of electric and thus locally emission-free driving. Its four-cylinder petrol engine, in conjunction with a powerful electric motor, gives it a total system output of 205 kW (279 hp) with a system torque of 600 Nm. The new C 350 e thus delivers the performance of a sports car while offering a certified consumption of just 2.1 litres of fuel per 100 kilometres in both its saloon and estate variants. 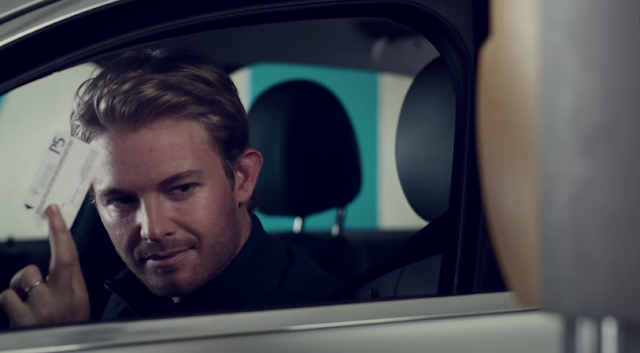 AdStasher: Nico Rosberg and Lewis Hamilton in Latest Mercedes-Benz Ad "Success has Two Sides"